No Response Festival returns for its third year, and have announced its full lineup. The two-day festival will run on Thursday, June 21st and Friday, June 22nd at Woodward Theater in Cincinnati, Ohio. 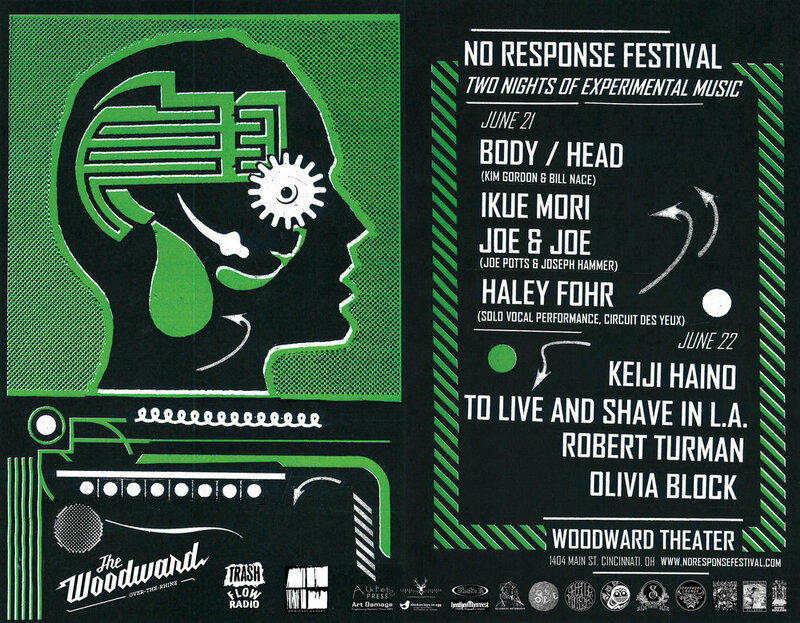 Thursday will be headlined by Kate Gordon and Bill Nace's Body/Head project while Friday will be headlined by Keiji Haino. Thursday's lineup also includes Ikue Mori, Joe & Joe (a duo performance from Joe Potts & Joseph Hammer), and Haley Fohr of Circuit Des Yeux. Friday's lineup is rounded out by To Live and Shave in L.A., Robert Turman, and Olivia Block. Advance tickets are $25 per day and will be $30 day of show. The festival will also be screening "Johnny Vortex presents D street: Avenue Of Fear," a performance art work written and performed by John Bender, Kate Gallion, and Jason Tannen in 1985 (58 min). There will also be screenings of music videos for Dementia Precox that were directed by Jud Yalkut. These screenings will take place across the street from Woodward Theater at the Mini Microcinema. These screenings will be free. In addition to all this, No Response Festival will host a show featuring John Wiese & Joseph Hammer on Saturday, June 23rd at Torn Light Records. The show will be $5. Tickets and additional information about No Response Festival can be found on their website here. Co-founders John Rich and John Lorenz also talked with WVXU about the festival. You can listen to that here.